Whether from decay, weakened structure, or even tooth loss, sometimes your teeth need some extra reinforcement to get back to full strength. That’s where dental crowns and bridges come in. At Glisten Dental, we offer only the best restoration options so that our patients can keep their smiles happy and healthy. A dental crown is a dental prosthetic that is placed over an existing tooth or an implant to replace the part of the tooth that is above the gum line called the crown. As both a functional and aesthetic restoration, a dental crown is made to replicate a natural tooth and do what your natural teeth do. As a result, it is cemented in place and can only be removed by your dentist. Treating a tooth with a dental crown is simple. If necessary, one of our dentists removes decayed areas of the tooth or prepares the tooth for the crown by removing some of its structure. Then we take an impression of the altered tooth. This mold is used by a dental lab in the fabrication process, creating a crown that will fit well against the surrounding teeth, as well as look natural. Before the completion of this initial visit, a temporary crown will be cemented into place to protect the prepared tooth while the permanent crown is being made. Similar to dental crowns, a dental bridge is an appliance that is used to replace a lost permanent tooth and preserve the spacing of the remaining healthy teeth. It consists of two crowns that anchor to the surrounding teeth with one dental crown in the middle for the missing one. Dental bridges are created in the same way as crowns. For dental bridges, two teeth are altered to accommodate the appliance. Impressions are taken to include these teeth, and two temporary crowns are placed. When the bridge’s fabrication is completed, you return to our office to have this single strong piece restore your smile’s function and beauty. 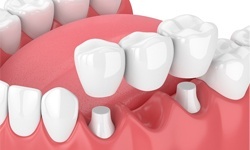 What are the benefits of dental crowns and bridges? Realistic appearance. 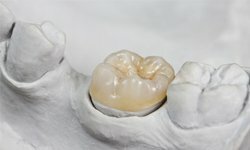 Porcelain reflects light much like enamel, so your prosthetic will look just like a natural tooth. Durability. Your crown or bridge will be able to withstand the normal wear and tear you put it through. Stain resistance. In fact, porcelain can resist stains better than enamel. Longevity. With the proper maintenance, dental crowns can last between 5 and 15 years, and dental bridges can last between 7 and 10 years before needing to be replaced. How do I know that I need a dental crown or bridge? Replace a large filling when not enough of the tooth remains. Cover a discolored or misshapen tooth. Cover a tooth that had root canal treatment. If you are evaluating your tooth restoration options after losing a permanent tooth, you can consider getting a dental bridge and discuss this option with one of our dentists. Our talented dentists have extensive experience in dental crowns and bridges and can provide the care you need to get your smile back to full health. When tooth repair is necessary, we can help. Contact Glisten Dental to schedule an appointment today!